Happy 15th Anniversary x Dr Benjamin Yim Clinical Aesthetics & Laser Centre! Recently, we have been invited to listen to Dr Benjamin Yim's talk at the Hard Rock Cafe, we were blessed to walk away with some knowledge on popular treatments like fillers and botox! 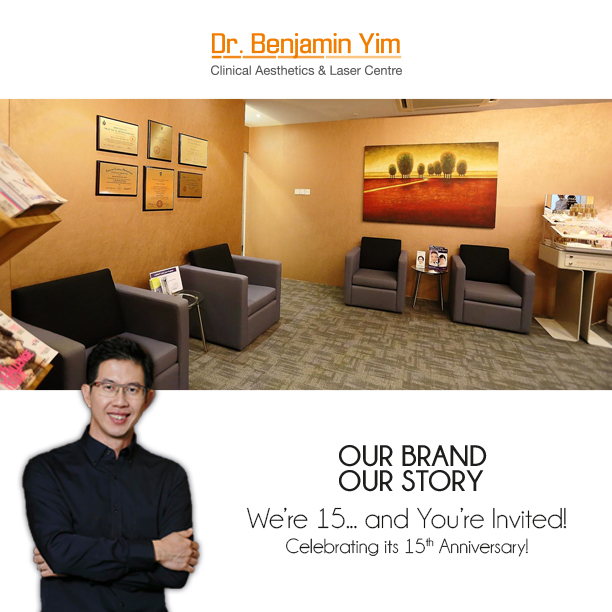 First, here's wishing the Dr Benjamin Yim Clinical Aesthetics & Laser Centre a very happy 15th anniversary! Tired of your boss or colleagues’ comments about how you always look tired worried or stressed out? Or perhaps you’re frustrated with well-meaning friends constantly asking you to try various anti‐ageing creams that target dull, saggy skin? These are common complaints most girls (or ladies) have. You're not alone. Dr Benjamin Yim himself showing us where he would suggest insertion of fillers to enhance her natural beauty. Model: Vet Leow. He is also one of the pioneers and a key opinion leader in the local aesthetics industry in Singapore. In their clinic, they also sell a wide range of skincare products, which keeps skin looking the best it can. The event was filled with various invited guests and we were very glad to have, Ms Priscilla Goh, makeup trainer from Jane Iredale Cosmetics share with us on their wonderful makeup products! Here's some photo snippets of a water resistant demonstration she did with the Jane Iredale Pressed mineral powder. It was power powder! Non-water absorbent, it totally doesn't go into the water at all! The same for other Jane Iredale mineral powder products! One thing I really liked was their sun products! Because Jane Iredale has 7 products that have earned the Skin Cancer Foundation Seal of Recommendation. To earn this seal, a manufacturer must provide scientific data showing that its products sufficiently and safely aid in the prevention of sun-induced damage to the skin. So, what can I say, super amazed! It'll be great for girls who love sports, and doesn't want natural moisture to be stripped away from the skin! The makeup brand is also a trusted brand of makeup recommended by plastic surgeons and dermatologists. It is understood that the makeup can also be used after aesthetic procedures. ...containing 5 pieces of hydrating masks, sunscreen SPF50 and Hydrating Cleanser (makeup remover) from Dr. Benjamin Yim's products! This was an invited media event.